"In over 30 years of looking after animals, I've never seen anything like this before." Gorgeous George gnaws his paws down to the bone and regularly chews on his hind pads causing them to bleed. The three-year-old Show Cocker Spaniel has been diagnosed with a rare genetic disorder that causes him to harm himself. At first, vets thought the rescue dog was self-harming because of stress but later, tests revealed that he was actually suffering from a genetic disorder called Acral Mutilation Syndrome. It's a persistent itching which worsens over time. George needs round the clock care and treatment. 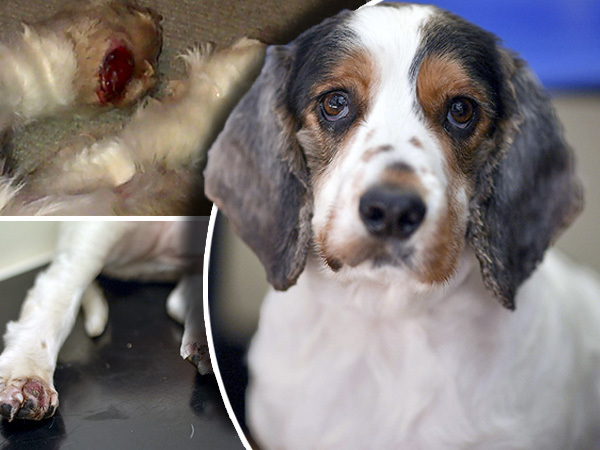 Di Harrison, from Tarporley, Cheshire and founder of Cocker and English Springer Spaniel Rescue (CAESSR ), the charity that cared and paid for George's treatment, says George had once almost chewed off his toes. 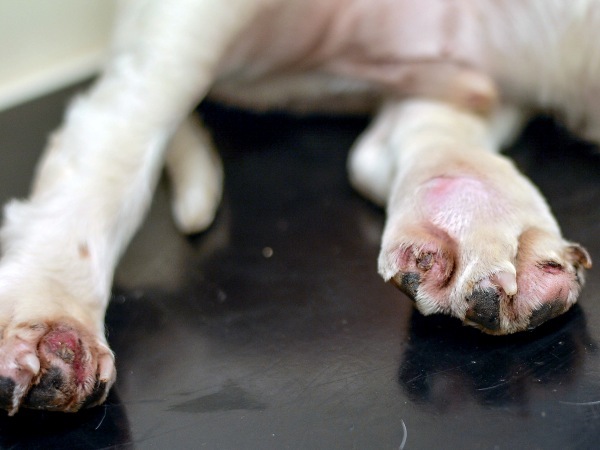 "George was chewing his hind paws and drawing blood - even when his owners were in the home. It was thought he was suffering pins and needles in his feet owing to a slight deformity on his spine but the chewing then became a habit." 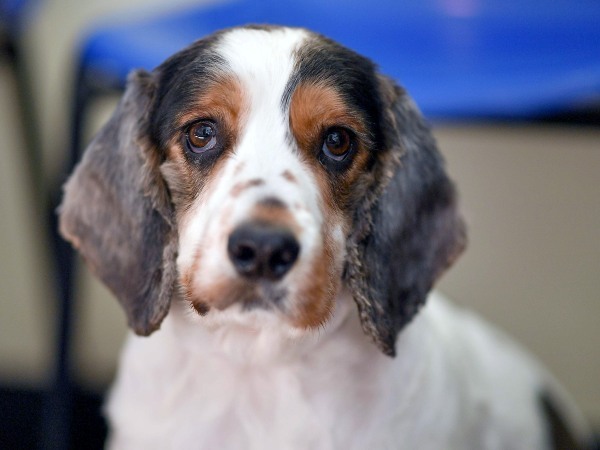 George came to them in March 2015 as a 10-month-old, and it was only after one of the founders read an article about the condition in a dog magazine that they found out what the real problem was. "In over 30 years of looking after animals, I've never seen anything like this before. Apart from the self-harm he's also had lots of other health problems, but he's a real fighter and has come through everything so far." George's treatment has set the CAESSR back £10 000 (R 163 555) in just two years. Di helped wean George off his chewing using bandages and two years on, his scars have started to heal. 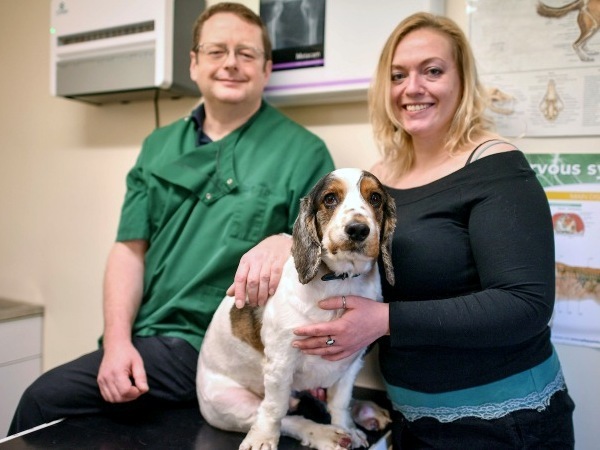 "He's such a lovely and friendly dog and we wanted to persevere with his treatment." The pooch has now been re-homed in Stoke-on-Trent, Staffs, and is well on the road to recovery thanks to a generous donation from Manor Court Veterinary Center, part of the Willows Veterinary Group. "After months of constant bandaging, George is now in a permanent foster home having had behaviourist help and many trips to the vet. The donation we received from Manor Court is very welcome and I can't thank them enough for it as we rely entirely on donations to keep going," says Di. Owner Laura Herbert, from Hanley, said she'd do anything for George and has even changed her job so she can properly care for him. "When I first started fostering him I'd just been made redundant and had plenty of time to spare for him. I then got a full-time job in construction management, but George has so many health problems including his self-harm syndrome, so I gave it up." "I now work part-time as a barmaid, and between me and my housemate Matthew Rogers, we can properly care for him, " she adds. Vet Richard Nolan from Manor Court Veterinary Centre says that although he has never treated George himself, he has heard his story. "It's a very unusual case as Acral Mutilation Syndrome is a vicious circle which starts with itching and ends up with an animal chewing its own extremities. I know George's treatment has been very expensive so I'm glad the donation from Willows Veterinary Group will make some contribution towards that." "George is OK at the minute but I know left to his own devices he'd start chewing himself again. People think I'm mad for what I do for George but he's such a lovely mature, adorable dog you just can't help yourself wanting to care for him."